Volumetric rejuvenation is defined as the method of restoring depletion in an aging skin by the usage of fillers injected into various depths of the skin from mid-dermis to subperiosteum, thus achieving facial harmony. Volumetric rejuvenation with its newer dynamics and molecules has replaced surgical methods of face-lift largely because of its minimally invasive technique, predicable yet reversible results, and larger safety approaches available. Volumetric restoration with injectable has witnessed a paradigm shift in the last decade with a global rejuvenation, acquiring a predominant emphasis over focal wrinkle filling, to restore the depletion pattern of facial fat layers. A face mapping performed for filler technique has thus evolved, with many experts advocating varied techniques from global restoration to point lifts at key areas, to improve the outcome of filler injections, albeit safely, thus simplifying the process. 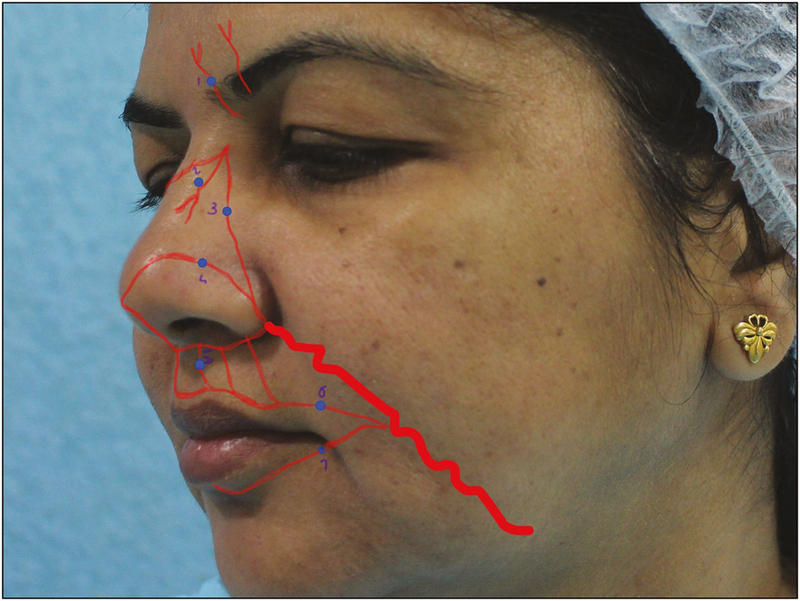 Respecting the Indian anatomy that is characterized by small bones and more fat pads on the face and their subsequent depletion, one has to use techniques to restore and enhance in step with patient-derived desires of beauty, ensuring that there is no crowding of volume anteriorly to make the face heavier centrally [Figure 1]. Figure 2: (A) Superficial pads of fat on the face. The fat pad depletion pattern makes the single crucial evaluation point needed for volumetric restoration. This emphasizes the aging curve for a particular patient and leads to predictive filler outcomes, if properly analyzed. 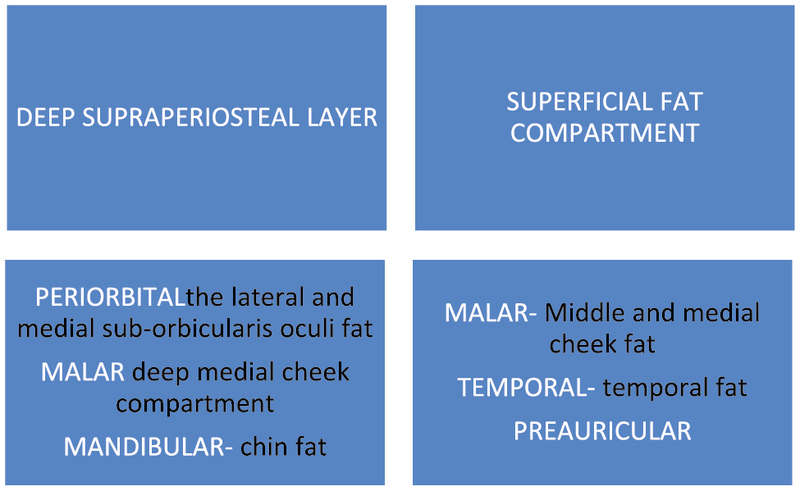 The deep plane of fat in supraperiosteal layer is the first to deflate in orbital zone laterally and medially; medial cheek and chin fat is subsequently lost.,[8 Superficial pad fat compartment shows more lateral],[ temporal],[ and preauricular fat loss than that of the middle and medial cheeks.,,, The nasolabial and jowl fold accentuation is more because of the loss of ligament strength than the fat loss, which happens much later [Diagram 1]. The pattern of fat loss is thus predictable, and the volume restoration should follow the pattern of fat depletion. Retaining ligaments reflect grooves and confine fat loss to compartments and not en masse [Figure 3]. Figure 3: Retaining ligaments of face. Patient evaluation constitutes the key steps carried out before restoring volume with fillers. A face map needs to be generated, incorporating physician and patient goals with a realistic consideration. The assessment includes consideration of age, race, gender, medical history, previous treatments, and so on. One must consider medical history, especially psychiatric illnesses, allergies, diabetes, hypertension, blood thinners and antiviral medications, history of cancer and hypertrophic scars or keloids potential, and so on, before conducting a filler rejuvenation. Previous injections used and their duration are of utmost importance; the previous need for hyaluronidase, usage of toxins, energy-based devices, and lasers are very important factors considered before conducting a filler treatment. 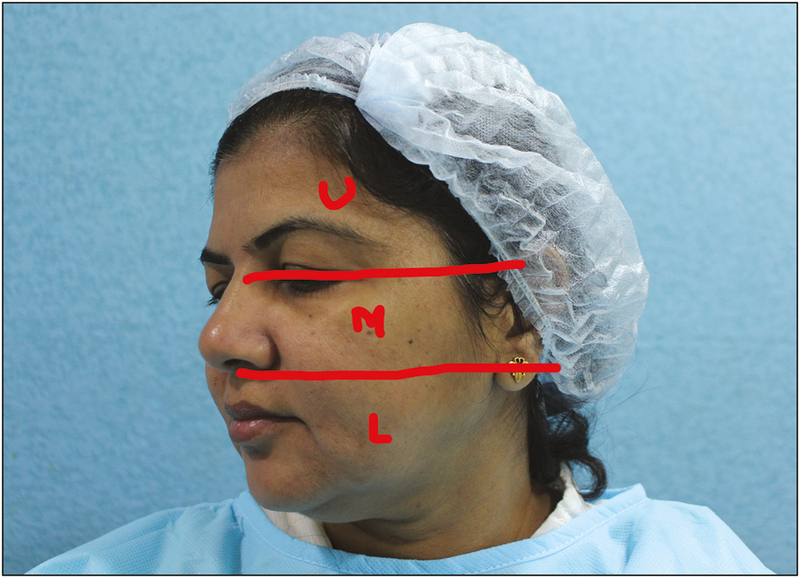 The patient’s desire to improve a fold/line should be considered if realistic, and a restoration plan to alleviate the problem should be scientifically and logistically considered, for example, if prominent nasolabial fold is a concern for the patient, a physician has to work on the midface area at cheek, and the submalar area helps to efface the nasolabial fold. Understanding the vectors is important, and the patient has to be counseled for the same. A physical examination is mandatory, especially to check for filler or toxin effects, preexisting brow ptosis, asymmetry, and so on. Racial variations in the anatomic features and landmarks make for different techniques in the volumetric restoration, keeping in mind the requirements and trends for rejuvenation. Important topographical landmarks that help one in defining the safe implementation of filler injections are available. The gender differences for male and female faces are considered before injections, [Table 1]. The action of light and shadow on the face helps one to assess and rejuvenate. Observation commands assessing the aging face by viewing the deflation of volume, observing the deterioration of soft tissue, and analyzing the descent of soft tissue as a result of deflation and disproportion with dynamic discord of muscle action before injecting. 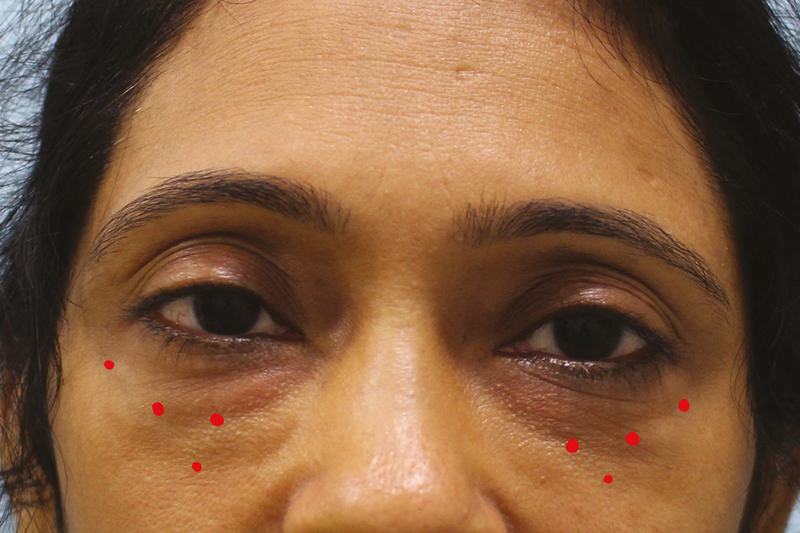 Vascular landmarks should be considered while conducting facial filler treatment. The potentially most serious side effect of a filler injection is vascular occlusion. Sheer vigilance and sound technique enable safer injection. The knowledge of key vessel pathway on the face is essential to practice safe injections. Important anatomic landmarks that help one to track the pathway of blood vessels are crucial [Figure 5]. Figure 5: Course and important branches of facial artery. Glabella: Supratrochlear and supraorbital arteries. 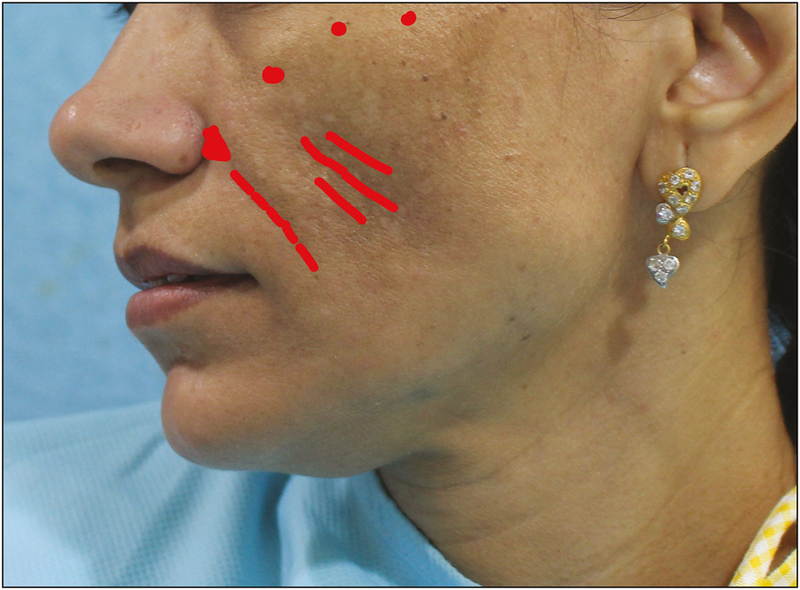 Injecting filler in this zone should be avoided, or the injection should be superficial. Infraorbital: While injecting malar zone, one must stay lateral to infraorbital foramen to avoid the infraorbital vessels. Nasolabial fold: Angular branch of facial artery/lateral nasal artery. In the lower part of nasolabial fold it is important to stay superficial while injecting and in upper 1/3 of the fold deep or periosteal injections are safest. Nasal tip: Angular artery. Vessels here are superficial, while injecting on the nasal tip, it is best to carry out on the bone or cartilage to avoid the lateral nasal artery. Temple: Temporal artery connected to internal carotid system and central retinal artery. Lips: Labial artery—superior and inferior branch. In lips, injections should be less than 3-mm deep, subcutaneous at commissures. The injections can be placed superficial to bone deep, and this depends on the volume loss and fat pad depletion as well as anatomic landmark in that particular area. General rule depends on the amount of volumetric lift required as well as the presence of vascular structures in that area. The approach to filler treatment simplifies when the physician is aware of the depth of placement of the filling agent [Table 2]. Usage of a needle or cannula depends on the depth of the filler injection and vascular network in the area. The cannulas are generally considered nontraumatic and safer, but not always. The cannulas may be large bore or small bore and flexible or rigid [Table 2]. Large bore canulas are used for large size particle fillers and smaller ones for cohesive gel fillers. 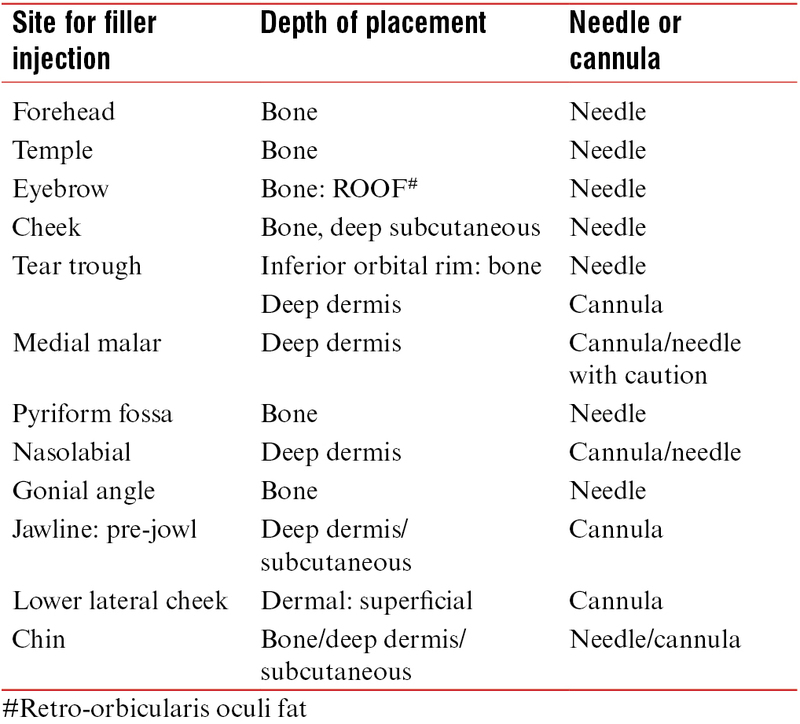 The choice of needle or cannula is largely injector dependent [Table 3]. 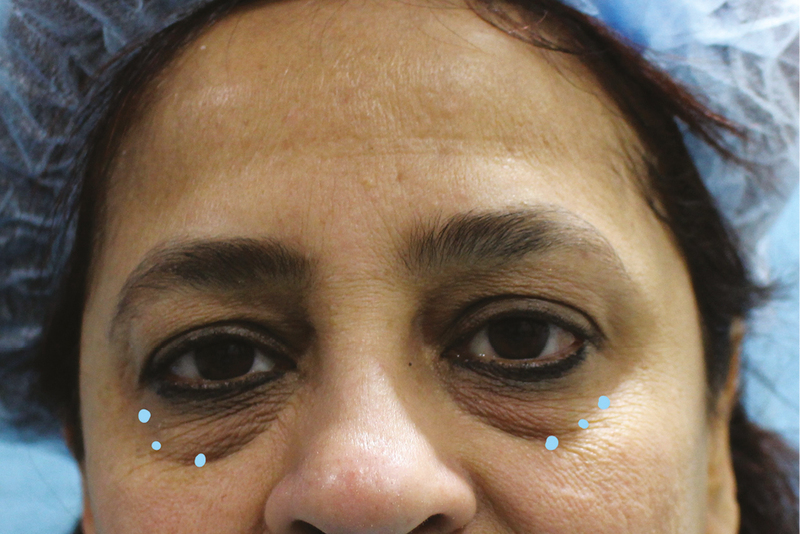 Cheek augmentation, nose reshaping, and tear troughs can be carried out with rigid cannulas, whereas the areas that need manoeuvring, such as lips, nasolabial folds, and Marionette lines, can be treated with flexible cannulas. For the ease of assessment, the face is divided into three zones: the upper one-third from the hairline to the nasion of the glabella, the middle one-third from the glabella to the nasal tip, and the lower one-third from the subnasal columella unit to the chin [Figure 6]. 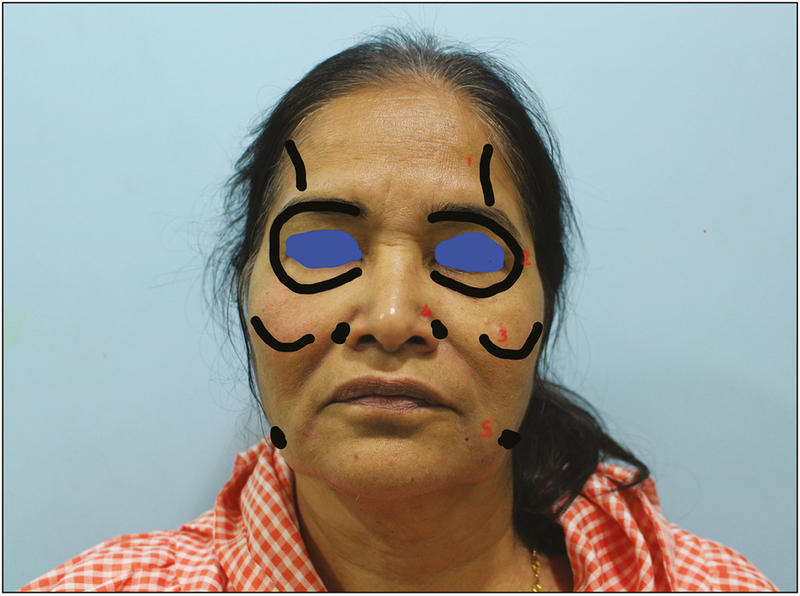 Figure 6: Three zones on the face. For the upper one-third restoration, periorbital forehead, glabella, and temples are addressed; whereas for middle one-third—periorbital, cheeks, nasolabial folds, and preauricular; and for lower one-third—marionette, chin, jawline, and neck. After a full pre-treatment consultation and a decision for the appropriate filler is taken, A 30 gauge needle or a 27 gauge is chosen, if filler is large particle sized depending on gel hardness it maybe easy or difficult to inject. Key focus is to inject slowly and without pressure. The key focus is to inject slowly and without pressure. Some syringes are prefilled with lidocaine; however, mostly for deeper and large volume injections, an infiltrative anesthesia as field block injections may be advocated. Talkasthesia may work for small area treatments in compliant patients. Upright/slight semi-tilt posture with head rest is good to minimize the effects of gravity. When evaluating the areas to inject, creating structure and volume in one area of the face may lead to improvement in another, adjacent part. Deep infraorbital injections that are used in injecting the infraorbital zone efface medial tear trough and nasojugal fold, creating a seamless lid cheek junction. Deep orbital plane is injected, as deep and supraperiosteal. Points chosen are lateral and middle and central infraorbitals [Figure 8], [Figure 9], [Figure 10]. The orbital-retaining ligament and the thin nature of orbicularis oculi fibers should be kept in mind while working in this zone. Superficial placements may generate Tyndall effect. The aging midface is highlighted by the loss of cheek projection and roundedness because of hypotrophy, sagging, and accentuation of the nasolabial folds owing to pseudoptosis of the skin and lateral nasojugal fold. This is often the first restoration that a physician prefers to achieve. Malar zone restoration has an impact of restoration in the same zone and a lift in the surrounding zones, [Diagram 2]. This point is also called as “ogee curve” as coined by Swift and Remington and is a crucial point for cheek enhancement in women, and the impact of this restoration is immediate because of the reflection and projection of light from cheek counter for point lifts [Figure 7]. Impact of fillers on malar zone on surrounding areas [Diagram 3]. The deep medial malar area restoration has a great impact on the midface and also lateral tear trough as well as the upper half of the nasolabial fold [Figure 11] and [Figure 12]. Through understanding this rationale, the treatment of the jawline, pre-jowl sulcus, and Marionette lines should start in the upper midface along the zygomatic arch and cheekbones. The mandibular zone rejuvenation includes treating around the mouth, chin, and jawline to create a harmony in the lower face unit. The volumetric rejuvenation in this zone has a great impact in restoring youthfulness [Diagram 4] and [Figure 13]A] and B]. Superficial, subcutaneous layer is mostly important in the lateral compartments. The treatment includes temporal and preauricular placements. 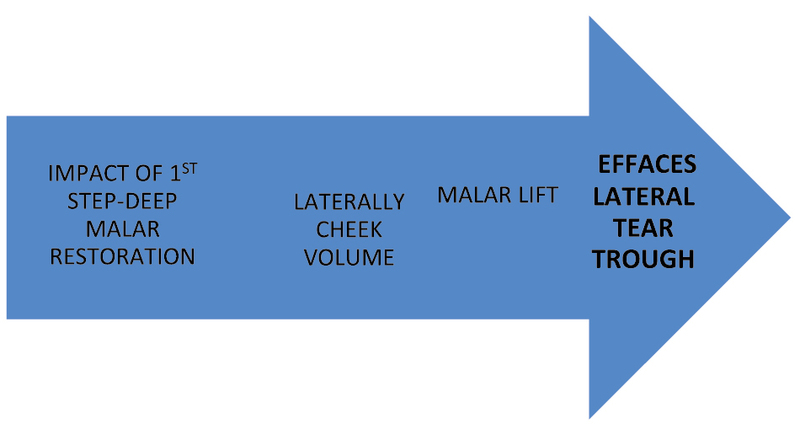 [8 The impact of treating subcutaneous plane is highlighted in [Diagram 5]. Sound knowledge is essential with respect to aging changes on the face at various levels of fat compartments, teamed with a detailed assessment helps physician to choose the right patient for filler injections. The factors such as filler rheology, easy injections, longevity, and cross-linkage help to choose an appropriate filler. Precise injection techniques and safe methods enable the physician to achieve best outcomes with least side effects, and the process is simplified when perfect execution of all the above factors is conducted. Fitzgerald R, Graivier MH, Kane M, Lorenc ZP, Vleggaar D, Werschler WP, et al. Update on facial aging. Aesthet Surg J 2010;13:11S-24S. Vleggaar D, Fitzgerald R. Dermatological implications of skeletal aging: a focus on supraperiosteal volumization for perioral rejuvenation. J Drugs Dermatol 2008;13:209-20. Rohrich RJ, Pessa JE. 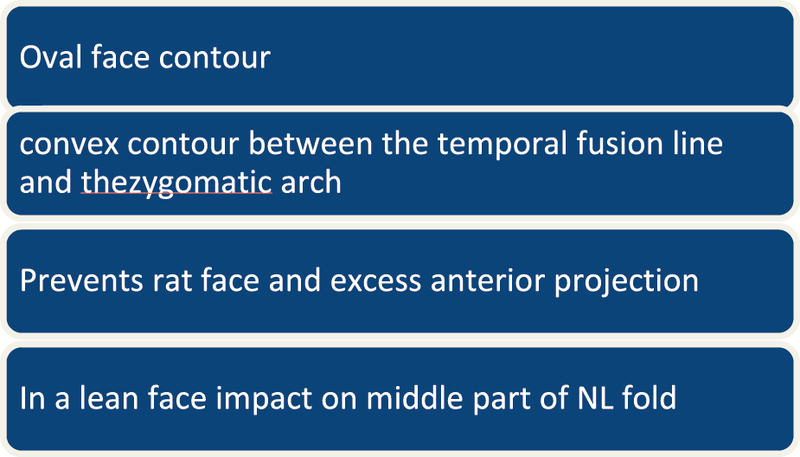 The fat compartments of the face: anatomy and clinical implications for cosmetic surgery. Plast Reconstr Surg 2007;13:2219-27; discussion 2228-31. Shaw RB Jr., Kahn DM. Aging of the midface bony elements: a three-dimensional computed tomographic study. Plast Reconstr Surg 2007;13:675-81; discussion 682-3. Mendelson B, Wong CH. Changes in the facial skeleton with aging: implications and clinical applications in facial rejuvenation. Aesthetic Plast Surg 2012;13:753-60. 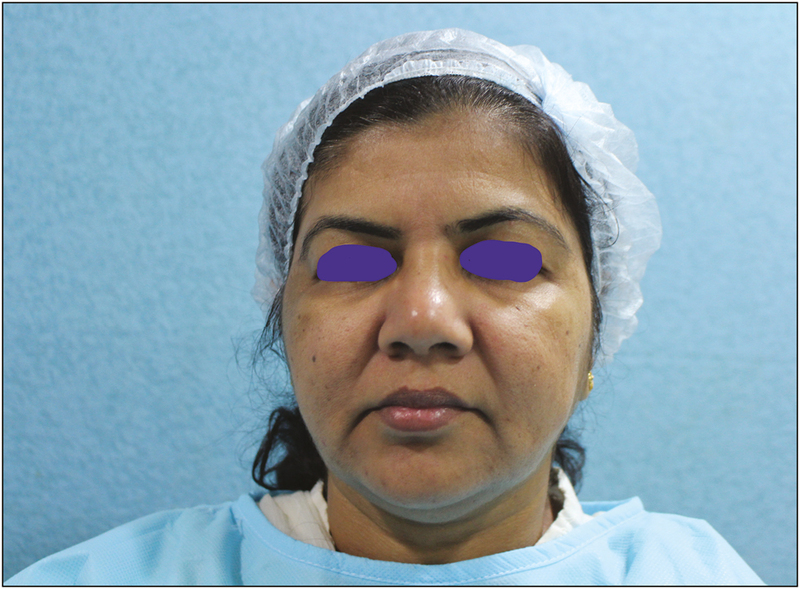 Shetty R. Outer circle versus inner circle: special considerations while rejuvenating an Indian face using fillers. J Cutan Aesthet Surg 2015;13:169-72. Casabona G. Dermatologist have now developed a 3 dimensional view of facial changes while aging. Dermatol Surg 2015;13:841-7. 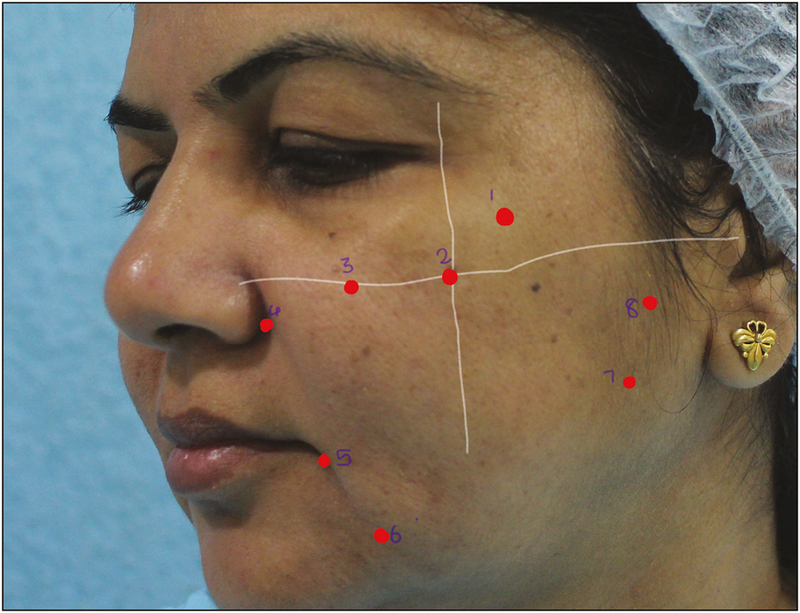 Salti G, Rauso R. Facial rejuvenation with fillers: the dual plane technique. J Cutan Aesthet Surg 2015;13:127-33. Arsiwala SZ. Current trends in facial rejuvenation with fillers. J Cutan Aesthet Surg 2015;13:125-6. Russo PR, Fundarò PS. The invisible lifting. Florence, Italy: OEO; 2014. pp. 109-57. Sandoval SE, Cox JA, Koshy JC, Hatef DA, Hollier LH. Facial fat compartments: a guide to filler placement. Semin Plast Surg 2009;13:283-7. Ozdemir R, Kilinç H, Unlü RE, Uysal AC, Sensöz O, Baran CN. Anatomicohistologic study of the retaining ligaments of the face and use in face lift: retaining ligament correction and SMAS plication. Plast Reconstr Surg 2002;13:1134-47; discussion 1148-9. Swift A, Remington K. Beautiphication™: a global approach to facial beauty. Clin Plast Surg 2011;13:347-77. Tan SR, Glogau RG. Filler esthetics. In: Carruthers A, Carruthers J, editors. Procedures in cosmetic dermatology series: soft tissue augmentation. Philadelphia, PA: Saunders, 2005. Leong PL. Aging changes in the male face. Facial Plast Surg Clin N Am 2008;13:277-9. Glaich AS, Cohen JL, Goldberg LH. Injection necrosis of the glabella: protocol for prevention and treatment after use of dermal fillers. Dermatol Surg 2006;13:276-81. Hirsch RJ, Cohen JL, Carruthers JD. Successful management of an unusual presentation of impending necrosis following a hyaluronic acid injection embolus and a proposed algorithm for management with hyaluronidase. Dermatol Surg 2007;13:357-60. Glashofer MD, Flynn TC. Complications of temporary fillers. In: Carruthers J, Carruthers A, editors. Soft tissue augmentation. Toronto, Canada: Elsevier Saunders; 2013. pp. 179-87. Kim DW, Yoon ES, Ji YH, Park SH, Lee BI, Dhong ES. Vascular complications of hyaluronic acid fillers and the role of hyaluronidase in management. J Plast Reconstr Aesthet Surg 2011;13:1590-5. Monheit GD, Prather CL. Hyaluronic acid fillers for the male patient. Dermatol Ther 2007;13:394-406. Lim AC, Lowe PM. Fractional filling with the microdepot technique as an alternative to bolus hyaluronic acid injections in facial volume restoration. Australas J Dermatol 2011;13:154-6. Raspaldo H. Volumizing effect of a new hyaluronic acid sub-dermal facial filler: a retrospective analysis based on 102 cases. J Cosmet Laser Ther 2008;13:134-42. Haddock NT, Saadeh PB, Boutros S, Thorne CH. The tear trough and lid/cheek junction: anatomy and implications for surgical correction. Plast Reconstr Surg 2009;13:1332-40; discussion 1341-2. Rohrich RJ, Pessa JE, Ristow B. The youthful cheek and the deep medial fat compartment. Plast Reconstr Surg 2008;13:2107-12. Haneke E. Managing complications of fillers: rare and not-so-rare. J Cutan Aesthet Surg 2015;13:198-210. Carle MV, Roe R, Novack R, Boyer DS. Cosmetic facial fillers and severe vision loss. JAMA Ophthalmol 2014;13:637-9. Shahrabi-Farahani S, Lerman MA, Noonan V, Kabani S, Woo SB. Granulomatous foreign body reaction to dermal cosmetic fillers with intraoral migration. Oral Surg Oral Med Oral Pathol Oral Radiol 2014;13:105-10. Funt DK. Avoiding malar edema during midface/cheek augmentation with dermal fillers. J Clin Aesthet Dermatol 2011;13:32-6. Rodrigues-Barata AR, Camacho-Martínez FM. Undesirable effects after treatment with dermal fillers. J Drugs Dermatol 2013;13: e59-62.